Excuse the dust bunnies but I had to share that the shore place is back in my hands now that the water damage related work is finally over. It also means I have to actually order/make/buy the stuff that I need to replace in here including drapes, art, a new kitchen table, accessories, etc. 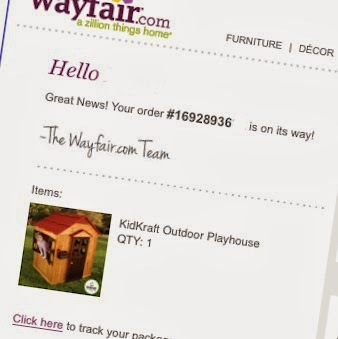 In other words, fun for me! As you can see from the photo, the stair runner is installed. Mr. Limestone isn't so much of a fan but I love this pattern. I couldn't find a runner rug that fit the bill so instead we hacked up a few of these indoor/outdoor door mats. I think it looks great but we shall see how it holds up over time. HI! I love how you did the runner. We're looking to do something similar. Any chance you could feature how you installed the runner? How many runners did you purchase and for how many steps? 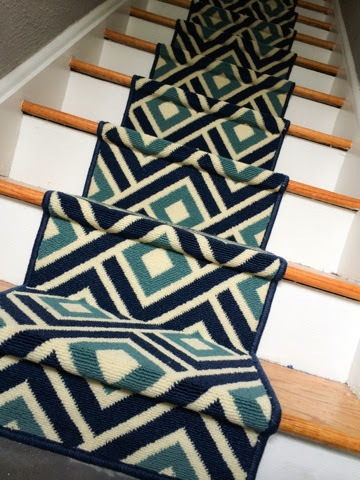 I used 5 rugs but I dont remember how many steps - rather I measured each rise/step to make sure I wouldn't be left with a seam in the middle of a step. The more rugs, the more cutting, so its best to get longer rugs. These are just pretty narrow steps so I couldn't go with the standard 30 inch runner rugs. If I could, I could have just used one!